William Reese. 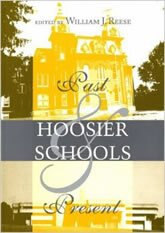 Hoosier Schools: Past and Present. Indiana University Press, 1998. Since the 1980s the U.S. has been preoccupied by school reform. Demands by parents, reformers, and politicians have included a return to basics, a longer school year, accountability through statewide testing, more effective vocational training, and workforce preparation for a more global, technological economy. Activists sometimes forget that schools are a product of history, that many proposed reforms have been tried before with mixed results, and that understanding the past offers a valuable perspective on current efforts to improve schools. Indian turned to public schools in the mid-nineteenth century to help solve a host of social, political, and economic problems. Despite conservative critics’ fears of ‘creeping federalism,’ public schools remain largely a state and local responsibility. This volume presents a series of original studies of school reform in Indiana, from the crucial decades before the Civil War to the most recent efforts to reshape local schools for a postmodern society.